“Working with Micah had a profound impact on me. In just 4 sessions he methodically guided me to where I needed in order to break through old limiting beliefs that were paralyzing me. I was indeed on the precipice, and he was in fact the catalyst to creating an internal shift that cannot be described in words. He is incredibly authentic and has a genuine concern for my well being and the evolution of my soul. He truly invests himself in the process and is kind and loving yet challenging when appropriate. Of course there are layers upon layers to sort through in this crazy human experience so, the work is ongoing, but I am just so grateful to have Micah in my arsenal of tools! If you want to live your life hovering at the surface in a stagnant small existence, don’t work with Micah. However, if you want to dive deep with tenacity and clear any obstacles to living in your power, then Micah is your man! He is highly skilled and a beacon of inspiration to living in fierce fullness! “I have known of Blacklight for a while through my sister. I would read his posts on Facebook and ALWAYS be so inspired by them. I appreciated everything he would share with the world on inspired living. He also worked with my sister as a coach/counselor. My sister would share about how helpful he was in her life. Sharing tid bits of advice he would offer to her. Then I started looking for some help in my life, and realized that Blacklight would be a great match. Blacklight and I have been working together for about a year and a half. It has been life changing. When we started working together I swore I could not be an organized scheduled person. Now I live by planning my week, staying on track, and completing goals. Blacklight holds me accountable to my commitments, while inspiring and motivating to conquer the next frontiers of my dreams, and in my relationships. Blacklight is helpful on a practical, how to organize your life front. But he is also a great ear for emotional /relationship work. He can set you up on finding your affirmations, working on those affirmations, working on how to properly communicate with your partner, definitely has some parenting advice to share, and is an all around ball of fiery inspiration to my life!!! “…after talking to you .. and reflecting, I was so much more there than I thought. “..Your empowerment coaching came around at the precise time I needed it. I was faced with a lot more free mental space because I wasn’t giving my work all of my mental power anymore. I didn’t realize it when we started, but I needed a guide to help me navigate all that new territory. Of course I had my goals for our sessions, but ultimately I know now they were a byproduct of the bigger picture- not knowing what my purpose was. I felt vulnerable at first because I thought I had been on the path to my purpose for the last two years at my job, but when I was fired I realized I had taken a pit stop and never got moving again. (I never mentioned this specifically at the time because I was focused on my goals for the sessions) . Your empowerment gave my journey both a focus and a goal. With a task for me to complete (aka homework), I spent less and less time trying to figure out my purpose. I moved in the direction that each step lead me, never thinking too far ahead or trying to plan this journey we found ourselves on together. Just taking one foot and putting it in front of the other with no idea where I was heading. The amazing things I felt, experienced, and learned about myself, by focusing on each foot as it passed through it’s motion as it took me forward a little more, can never be fully explained to anyone well enough for them to truly understand what has happened to me (you might be the only one). But as you said yesterday, I don’t need to say it-just be it. Through your empowerment coaching, my purpose has found me. I believe my soul has known its purpose and has been waiting patiently for me to be ready to let my body receive it. As soon as I let go of my attachment to my body (i.e. its insecurities, fear, and doubt), my purpose was revealed as having been there all along. You have TRULY empowered me to run full speed in the direction of my purpose free of insecurities, fear and doubt. “..You have given me many gifts and blessings along the way. One of them is the space where direct intention can be spoken, but somehow always allow and intend for positive action/intention. Thank you for shining a light on this path between sincerity and belief. Thank you for your beliefs. For your word. For your words. Thank you for your special kind of Light. 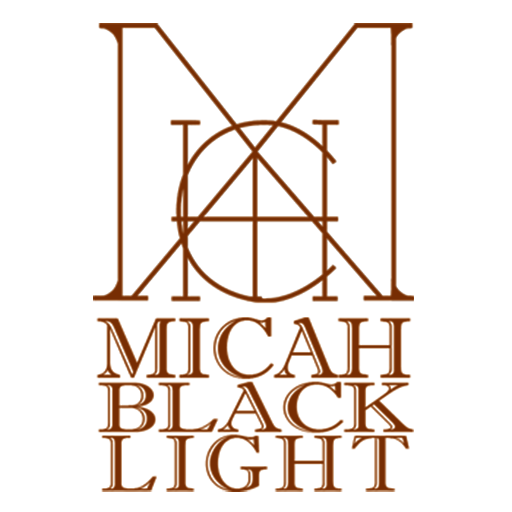 Micahlight. Blacklight. Sharplight. Lovelight. “..I will again and again exclaim my eternal “Thank Youuuuuuu Micaaaaah” for teaching me to be to celebrate my whole and complete Me 🙂 my wild abandon uninhibited shining beaming shadow and aaaall me :)))). “– INEFFABLE! That is the word… BECAUSE if I did have a recording , I would make a life size paper doll “MicahBlackLight”, carry Him along with an amp and a mic to Grand Central and play it and give your contact info to every person I could reach. I want to promote you! and I vow that I I will be graduate that you can count on when you are interviewed by Oprah or Diane Sawyer or/and ….to use as an example of “before” and “after” shots bwahaaaaaa!! The Micah Make-over Show!! May I be your tap dancing telegram girl that ratatat-taps with a beaming admiration in front of the curtain before your monologue? Truly, I want to go gorilla and start tagging your web address and your quotes all around this land.. In the mean time I am sharing with my peoples and encouraging anyone that is sincerely ready to kick their own booty into high gear, to connect with extraoooorrrrdinarrryyyyy YOU!